I know it’s been a while. Sorry. On the other hand, it’s not like something earth-shattering has happened in the last couple of weeks. First, I’ve finally finished my Angkor series, with two more reports to come, Bangkok and Koh Samui. Do check it out. It was a trip of my life. Seriously, you must visit this place and see the magic for yourself. Over at Frugal Travel Guy, I started the series of posts about domestic and foreign loyalty program. They are not in-detail analyses, but rather a brief summary of features. I began yesterday with Alaska Airlines, and will continue with American, US Air, United, etc. The most popular hotel programs, such as Hilton HHonors, Marriott Rewards, and others will be covered, too. Also check my other FTG post while you’re at it: Five Practical Travel Apps. BoA Virgin Atlantic credit card has lost 1/3 of it’s appeal to me this week when their transfer rates to HHonors changed from 1:2 to 2:3. I don’t have any other use for Virgin Atlantic considering their phoney fuel surcharges. Although, that card is still not a bad deal if you look at it as buying HHonors points at 0.2 cents per point, as 50,000 Flying Club bonus miles will give you 75,000 HHonor points (the card has a $90 annual fee). The New US Bank FlexPerks Olympic Bonus is just in time for the Sochi games (see the link in my Best Credit Cards for Free Flights section). It’s the same deal as before: you get 20,000 regular sing up bonus points and additional points for every medal won by Team USA. Last year, I ended up with 33,000 point bonus which I recently used to buy airfare between Siem Reap, Bangkok and Koh Samui. You can redeem FlexPerks points for airfare at 1:2 in $100 increments, i.e. 10,000 points get you a $200 flight, 20,000 — $400 flight, etc. Program devaluations are a fact of travel life. We’ve seen negative program changes from most of the major hotel chains during the past 12 months. But most programs give their members a heads up that, for example, award-price increases are coming. That’s common courtesy. And ethical business practice. And you thought Hilton was bad! Great job Wyndham. You are now Sky Pesos of the hotel world. Want to understand why banks send us around the world on their own dime? Read this post from Frugal Travel Guy himself: Risk Management Business Decision. Really, I don’t link it because I write for FTG, but because this is fascinating stuff. 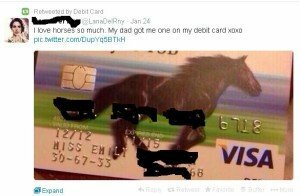 It’s not like the article told me anything I didn’t know, but it reaffirmed my notion of our uneasy partnerships with credit card issuers, with each of us looking for completelly different things out of it. While we keep benefiting tremendously from credit card industry, great care needs to be taken to make sure we do not become their demographics one day. 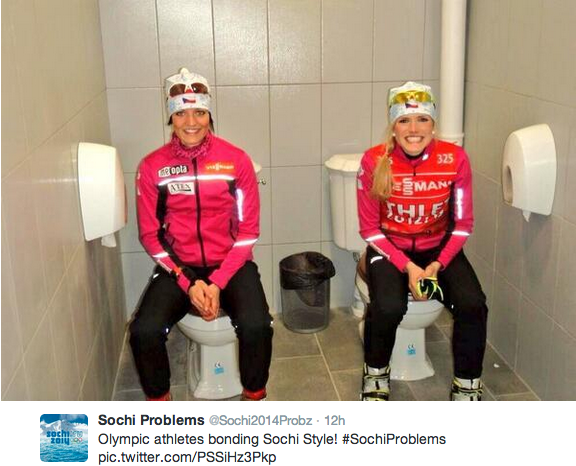 Everyone’s had a good laugh with #Sochiproblems by now with double toilets, uncovered manholes (insert your favorite insensitive gay joke here) and bathroom surveillance cameras. Now, it turns out that at least some of those are either fakes or have nothing to do with Sochi, to begin with (Eight Viral Sochi Olympics Photos That Are Total Lies). On a positive note, watching the opening ceremony on TV made me doubt that Russia’s “outrageous incompetence” paradigm. Yes, I personally liked the opening, fifth ring notwithstanding. You might remember one of the Seinfeld’s episodes where Jerry and George are arguing who of them is a bigger idiot. Well, they were both wrong. There are a bunch of gigantic idiots who are so incredibly stupid they even have their own Twitter page. That doesn’t include the founder, of course. Someone who can drum up 15K followers with 200 twits can’t be an idiot, right? Genius is more like it, I guess. Note that the paint job is mine. I just couldn’t bring myself to post this pic in all its uncensored glory, even though the proud horse-lover didn’t mind to do it herself. And people still wonder how Nigerians princes have managed to find so many takers. On this optimistic note, good night, and have a great week. ← Angkor Without Temples: Tuk-Tuk, Massage, Lady Boom-Boom?